Welcome to The Perfect Sentiment next challenge this week challenge we are focusing on friendship and the twist will be to use the sketch provided. We have a great sponsor this week as well. 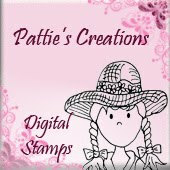 Patties creations which is providing as a prize one free digital stamp of the winners choice. Here is the sketch for you to use on your friendship card this week. Here is my card for this week challenge inspired by the sketch. On my card i used scallop circle nestabatlies and papers from my minds eye find and dandy line. My sentiment is from stampin up 24-7 and i added some pretty yellow flowers. Make sure to stop by my fellow dt members for some more friendship inspiration this week. I had a very stressful day in the blogging world so i have come to a decision and that is i am moving my blog to wordpress. I was locked out of this blog all day with no response from google about how to get back in. I had to use my home phone land line to finally past the verification lockdown i was in. So long story short if you like to continue to follow me please head over to my new home www.tweetybugshouse.wordpress.com and follow me their. I have moved all my posts from here to wordpress and you can still come here as i not deleting this blog just moving to wordpress. Thanks for supporting me and leaving all your kind comments. There will be one more post on here tonight as it was scheduled to go before my lockdown today but after that post you will see all new postings from me on wordpress. Over at the bells and whistles challenge they are now giving us a whole month to play along with the challenge. For january they want to see your elisabeth bell creations anything that resembles Winter, ice, snow & cold! Brrrrrrrr. I used one of the cute snowbaby stamps and bo bunny snow fall paper collection. Image is also colored with copics and i added a snowflake charm. Sentiment is from there she goes. Over at the ribbon carousel challenge this week we are not only using ribbon of course but we are also using a great sketch. some odd girl is the sponsor so head on over and enter your card. 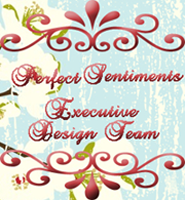 Hi and welcome to another wonderful challenge with The Perfect Sentiment challenge blog. This week challenge is all about birthdays with the twist of using Emboss resisting technique. If you click on the link you be taken to a great tutorial on how to do this fast and easy technique. 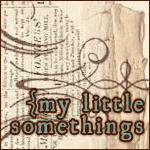 We have a great sponsor for you this week My little somethings the prize this week is a grab bag of crafting supplies valued at a minimum of $15 ` limited to US participants. In the event a non-US participant wins we will reward them with digital images. 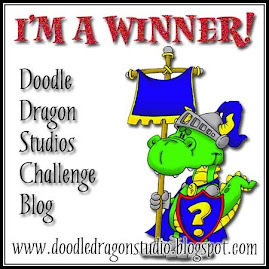 Over at the sparkle creations challenge blog you have the opportunity to work with a great sketch. I choose to use cafe lucy on my card along with the new echo park yours turly paper. My image is colored with copics. This week at there she goes challenge blog the theme is back to nature. So if you have a set that has a cute critter and nature then your good to go. Welcome to tweet designs. Here you will find my contest submission for various blogs i like to visit like cuttlebug.blospot.com and bitten by the bug. I hope to share designs i made with the cricut design studio and any future scrapbook layouts that i make. I hope your inspired when you come visit to make your own creations. Thanks for stopping by today.